Stainless steel case with a black leather strap. Fixed rose-tone bezel. 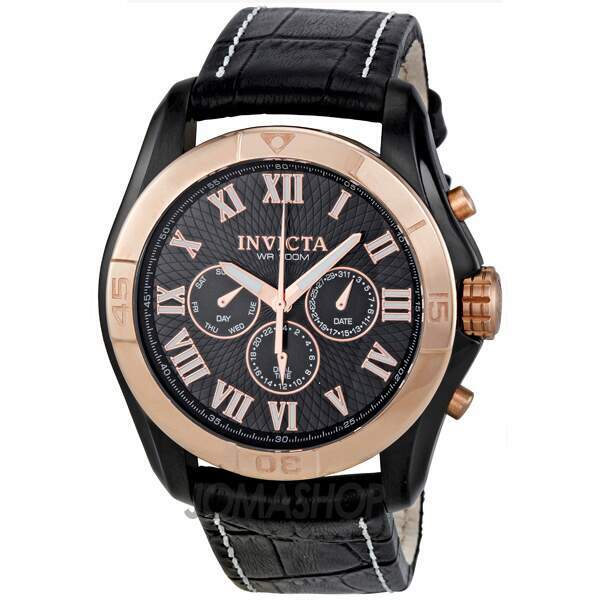 Black textured dial with gold-tone hands and gold-tone Roman numerals hour markers. Minute markers around the outer rim. Dial Type: Analog. Luminescent hands and markers. Three sub-dials displaying: day of the week, date and 24 hours (GMT). Quartz movement. Scratch resistant flame fusion crystal. Push / pull crown with function pushers. Solid case back. Case diameter: 47 mm. Case thickness: 13 mm. Band width: 24 mm. Band length: 10 inches. Tang clasp. Water resistant at 100 meters / 330 feet. Functions: GMT, second time zone, date, day, hour, minute, second. Dress watch style. 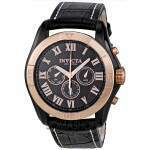 Invicta Specialty Elegant GMT Mens Watch 10636.